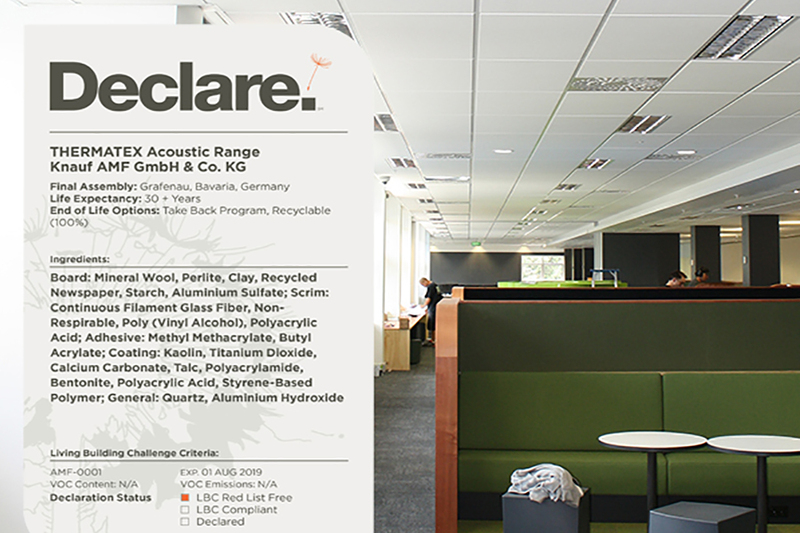 Declare is an ingredients label for building products developed by the International Living Future Institute.The Red List represents the materials, chemicals and elements known to pose serious risk to human health and the greater ecosystem. Examples of these materials include lead, mercury, asbestos and phthalates. A product granted Declare Red List Free Status, cannot contain any of these harmful materials.The AMF Thermatex products proudly carry the Declare Red List Free label are mainly made from biosoluble wool, clay, perlite, starch and recycled ceilings. The ceiling boards are available in standardized as well as customized sizes, shapes and systems and can be recycled at the end of their usable life. Smooth textured Thermatex Acoustic Range provide excellent acoustical sound absorption, high light reflectance and durability including impact, scratch and soil resistance. The mineral boards provide high acoustical performance; in NRC and CAC. The products therefore have a good performance for closed and open plan offices, conference rooms, classrooms, healthcare applications.